Rajiv Maragh — who returned to riding at racing's top level mere weeks after being sidelined for 15 months with career-threatening injuries — is the recipient of JockeyTalk360.com's third annual Comeback Jockey of the Year Award, presented by Horsemen's Track and Equipment. Horsemen's Track and Equipment president Randy Bloch will present the 32-year-old Maragh the award during the Jockeys' Guild Assembly luncheon Tuesday, Dec. 12, at Las Vegas' MGM Grand. The JockeyTalk360 awards are in addition to the honors handed out at the luncheon by the Jockeys' Guild. Maragh said he thought he was “going to die” when his mount in Belmont Park's fifth race on July 10, 2015, landed on the jockey after clipping heels and falling. The jockey sustained eight broken vertebrae, a collapsed lung and broken ribs that left him bed-ridden for weeks and in a body brace for nine months. “I was in a bad physical and mental state for a long time,” Maragh told The (Louisville) Courier-Journal last spring. “It was frustrating. All that time, all I can really remember is pain — pain and suffering. That's all I could remember for a year. Maragh resumed riding in November, 2016. The Jamaican native has won more than 100 races and purses approaching $7.3 million since his return, including taking the Grade 1 Wood Memorial and finishing second in the Belmont Stakes on Irish War Cry and winning Saratoga's Grade 1 Ballerina aboard By the Moon. 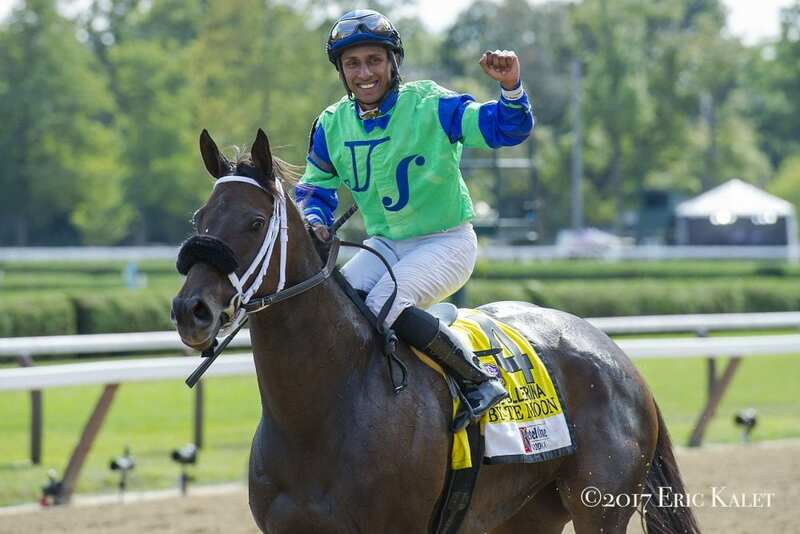 This entry was posted in People and tagged comeback jockey of the year, Horse Racing, jockeytalk360 jockey of the week, Rajiv Maragh, thoroughbred by Jennie Rees. Bookmark the permalink.